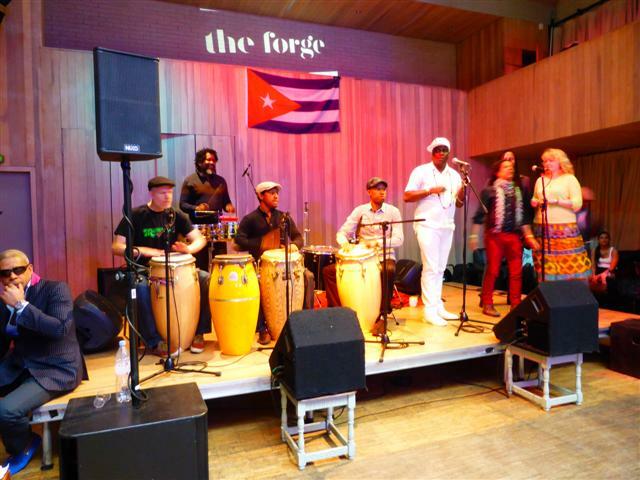 Home » Blog » Celebrities » Clubs'N'Pubs » Concerts » Featured Articles » London » music » UK » London’s Rhythms of Cuba! Cuba throbs with rhythm, music and dancing everywhere you go. I always look both ways when I come out of the loo as I expect a group to pop up and start playing Chan Chan! And the music doesn’t stop when they leave Cuba. 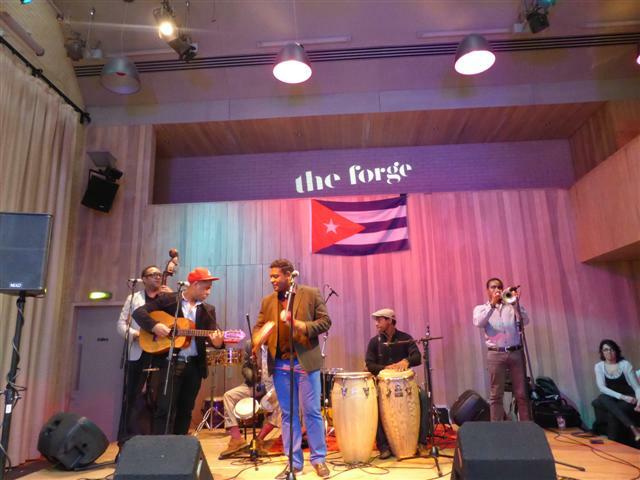 The Cuban music scene in London is as lively as it is in the Caribbean island. 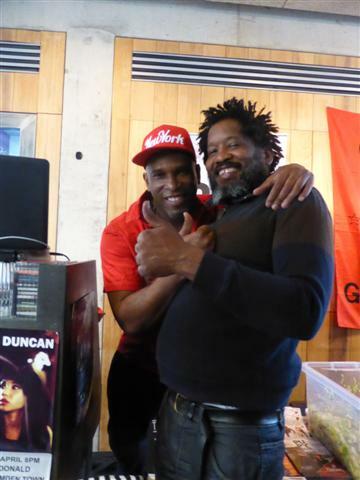 I was invited to a Cuban event in Camden by my Cuban friend Oreste Noda. 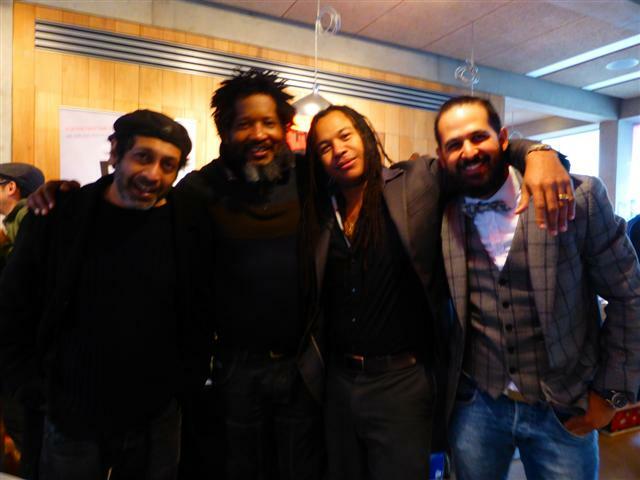 He’s a musician, teaching Congas, Bongo, Timbal and much more. 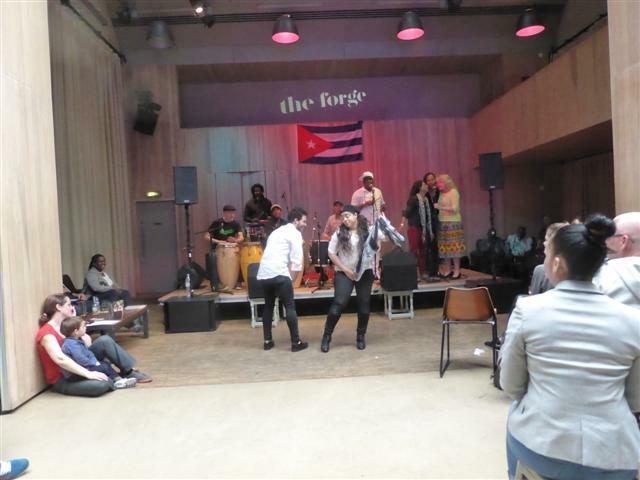 Every month a lot of the Cubans living in and around London get together to eat, drink, play music and dance. It starts at midday and goes on non-stop till midnight. 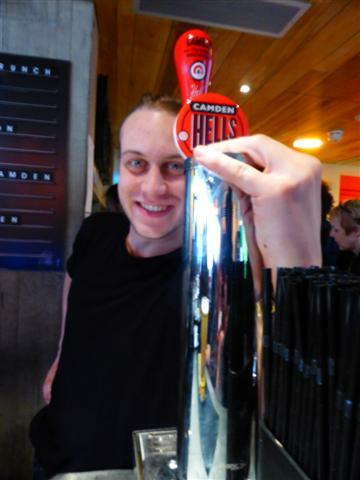 I browsed around Camden’s markets and then made my way to The Forge at four. The event was already going strong and the atmosphere was friendly and welcoming. A DJ was playing Cuban music and there was a buffet of FREE Cuban food, with pork, chicken, beans, rice, plantains and a huge bowl of salad. The bar was busy and I was surprised to discover a locally-brewed lager for sale. Plenty of children were there, all dressed up. They didn’t run around shrieking and annoying everyone; they danced! And, boy, could some of them dance! A senior gentleman was dancing the salsa with a much younger female. He was absolutely brilliant, flexible, and moved like someone less than half his age! He could shake those hips like a 20-year-old! Forget fitness classes, the gym, etc. to stay young and fit. Take up salsa! The live music was due to start at four. But of course, this is Cuba in London, so it started at a Cuban four, which was 4.40! A procession of percussion musicians led the way onto the stage where they were joined by guest singers. The whole thing was performed with drums, bongos, other percussion instruments and the singers. But you wouldn’t have known that there were no guitars, etc as it was so enthusiastic and musical. Then the dancers joined in on the ground, led by Damarys Farres who runs a Cuban dance school. After this, the next group assembled on the stage, with all the usual Cuban instruments, including trumpets. The atmosphere was building up and the audience loved it, and the dance floor quickly filled up. I had to leave to catch my train. but I’ll definitely make the journey there again! 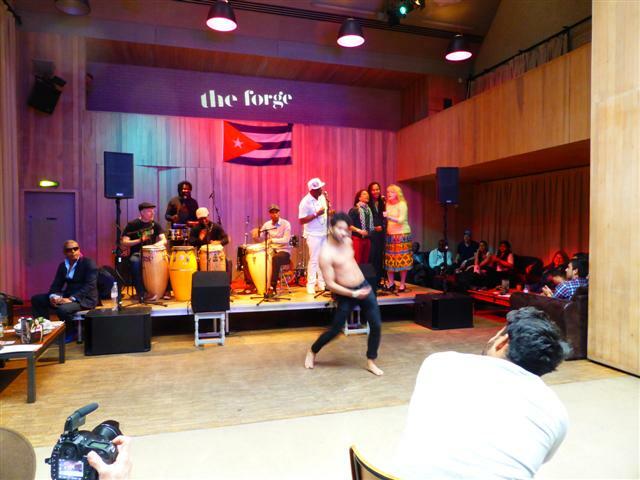 The Forge, a Music and Arts Centre, is a purpose-built acoustically-designed concert venue in the heart of London’s Camden Town. Housed in a sustainable, architecturally designed building, boasting both a RIBA and a Civic Trust Award, the Forge shares the space with on-site Sicilian restaurant Caponata. It is a unique and flexible space that creates a relaxed atmosphere in which to enjoy the best in classical, jazz and world music. With seating for up to 100, the Forge offers an intimate experience of performances, not possible at larger venues. 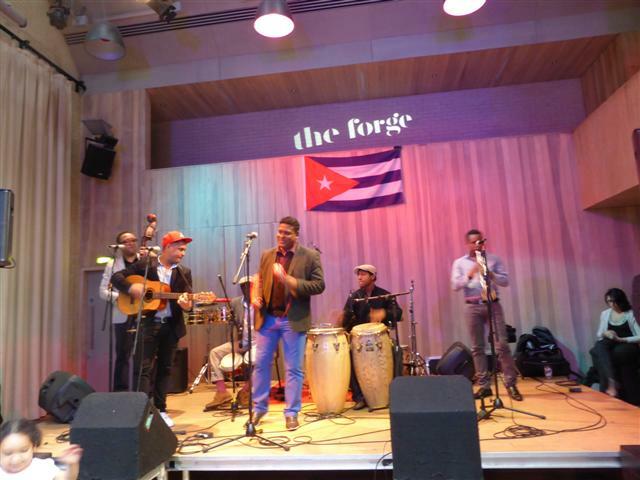 The Forge has two full and varied seasons of music a year, and since its opening in 2009 has become recognised as one of London’s most exciting small venues, presenting both established and up-and-coming new artists side-by-side. Top of the range facilities combined with exceptional live music, delicious food and drink and a friendly family-run atmosphere, have resulted in acclaim from audiences, critics and musicians alike. For a full programme and tickets, visit www.forgevenue.org. I will appreciated it very much as your article its wonderful and Im pretty sure lots of people would be reading about it, but unfortunately my websites addresses aren’t correct. « Mumbai Memoir 31- Feeling Hot! Hot!! Hot!! !